Strategic position just steps from the chairlift Socrepes Tofane ski area. Apartment P. T, refined and elegant style, with Tyrolean lounge, private entrance, 2 bedrooms, 2 bathrooms. Large kitchen and living room and small garden of relevance tavolio and chairs. Master bedroom with bathroom with shower, sink, toilet and bidet; room with bunk beds; bathroom toilet and sink. Entrance with wardrobe and hangers. Comfortable armchair-bed in the living room. It equipped with washing machine 7kg, dishwasher, electric oven, microwave, fridge / freezer, 2 TV. Ideal place for those seeking peace and quiet. Ski bus stop 50 meters bus, to reach any location without using the car. The center of Cortina is just 2 km. Adventure park 1km. You reach the ski lifts of Socrepes and Lacedel comfortably from home with boots on their feet. In addition, for your moments of relaxation you can also use our lawn / park with gazebo, table and deck chairs a few steps from home, admiring the view on the Tofane, 5 Towers and Faloria surrounded by nature; vegetable garden with local products of our production. An ideal place to relax and easily reach every place for hiking, walking, skiing and shopping. The apartment has two bathrooms, one ATTRIBUTABLE TO BEDROOM, BATHROOM, WC, bidet, sink, washing machine INDESIT WITH LOADING 6.5 KG. OTHER VERY COMFORTABLE WITH WC, BATH, AND SINK. VERY QUIET, CLOSE TO THE LIFTS OF Socrepes. PERFECT FOR LOVERS OF SKI AND HIKING. TO SPEND YOUR MOMENTS IN QUIET 'More ABSOLUTE. 2. ABOUT 5 KM FROM THE CENTER OF THE CITY '. 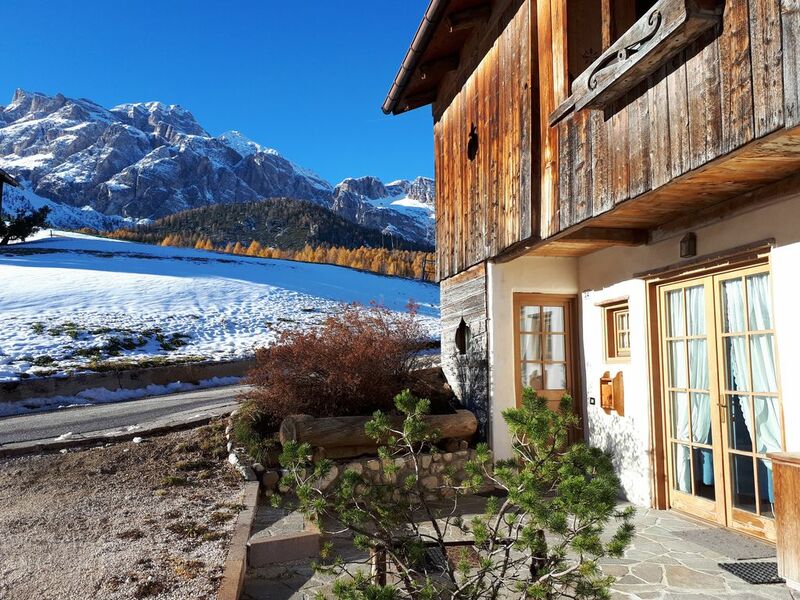 Abbiamo trascorso una bellissima vacanza sulle nostre amate Dolomiti di Cortina. La casa della signora Silvana -che ci ha accolti con inimitabile gentilezza e cordialità - è posizionata a 2 passi sia dalle piste di Socrepes che dalla fermata di autobus e skybus. È quindi possibile trascorrere la vacanza anche senza auto. La casa è comoda, pulitissima e fornita davvero di tutto ed ha un cortiletto assolatissimo che invita all’ozio. Bella esperienza da ripetere e consigliare. Davvero ottima la torta con la quale la signora Silvana ci ha accolti. The apartment is perfect located about 2 min to go to the Socrepes lift with the acces to many blue and red slopes. At Socrepes lift there are many different sci schools. The host has greeted us warmly with a delicious self-baked cake! The apartment is very comfortable with everything we could need. Appartement très bien équipé, très fonctionnel. Quartier plutôt calme. È stata una settimana piacevolissima. Come al solito questo appartamento e soprattutto la sua padrona sono meravigliosi! Grazie, grazie e ancora grazie, anche voi siete speciali!!! Mi rende sempre particolarmente felice, vedere ritornare i miei ospiti per le loro Vacanze nel mio Splendido Chalet Lacedel! L'abitazione è molto comoda per la vicinissima distanza con le piste sciistiche della Tofana.....e per famiglie con bambini, lo è ancora di più. Vi aspetto anche li prossimo anno!!! And 'the queen of the Belluno Dolomites. Inserted in the natural park of the Dolomites already recognized by UNESCO as a World Heritage Site. Ideal place for the practice of Ski Mountaineering, Cross-country skiing, Golf, Cycling, Hiking, hiking, Nordic Walking, Hiking, Mountain Bike. Located at 1224 mt. above sea level. It has about 6500 resident in peak season also coming to 30. 000. Very well served by an efficient public transport. Eventually taxi. Nel prezzo sono comprese le spese anche la biancheria da camera cucina e bagno, eccetto le spese di riscaldamento che verranno conteggiate separatamente in base al consumo € 0,40 KWH e acqua calda €30,00 al metro cubo Come conferma prenotazione chiediamo un terzo dell' importo totale a titolo di caparra, per i periodi di alta stagione il saldo dovrà avvenire entro 30 giorni dall'arrivo. Non accettiamo pagamento con carta di credito. Arrivo giorno dopo le ore 16 - parenza entro le ore 10 Dal 1°Giugno 2018 Tassa di Soggiorno €2,00 a persona al giorno per massimo 5 giorni di soggiorno da pagare all'arrivo.Esclusi bambini sotto i 12 anni. Qualsiasi danno riscontrato durante il soggiorno, dovrà essere interamente pagato al momento della partenza, seguirà fattura.